Lost treasure. Perilous adventures. Deadly foes. Tory and her friends are just starting to get a handle on their super-heightened wolf-like capabilities—contracted during a medical experiment gone horribly wrong—when they find out funding is being pulled from the institute where their parents work. The pack now faces its greatest fear—separation. So when Tory stumbles across ancient lore hinting at a lost pirate treasure, the Virals devise a risky plan that pits them against fiendish traps, headless corpses, and deep underground tunnels. But they're not the only ones looking, and the competition could be lethal. They'll need to work as one mystery-solving canine force if they to hope to uncover the lost fortune, save the institute, and stick together! Kathy Reichs (www.kathyreichs.com), like her iconic character Dr. Temperance Brennan, is a board-certified forensic anthropologist, and creator of the Fox television hit Bones, now in its eighth season. Reichs has written fourteen books in the Temperance Brennan series, all New York Times bestsellers, including #1. Seizure is her second of three novel for young readers. 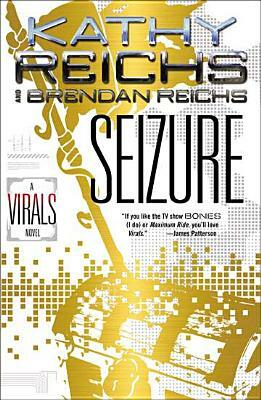 Brendan Reichs (www.brendanreichs.com) was born and raised in Charlotte, North Carolina. He graduated from Wake Forest University in 2000 and The George Washington University School of Law in 2006. After three long years working as a litigation attorney, he abandoned the trade to co-write the Virals series. He lives in Charlotte with his wife, Emily, daughter, Alice, and son, Henry. He plans to keep writing novels until they drag him from his desk.